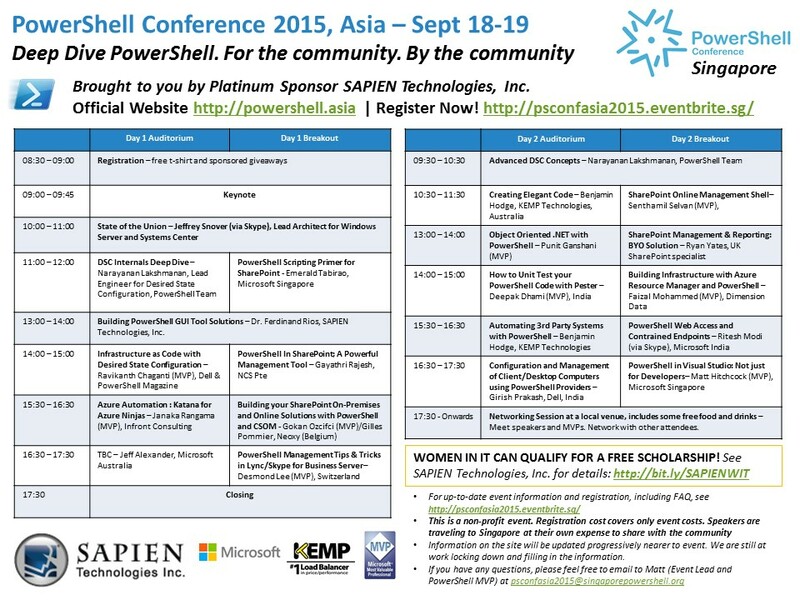 Home › Technology › Beginners › PowerShell Conference Asia – Is it for Beginners too? Looking through the agenda, I think there is a lot that a beginner would get out of it, so how might the conference experience look to someone just starting out to PowerShell? Yes, this conference is small enough that all of our speakers have time to talk to you one on one! Listen to Janaka Rangama (MVP) of Infront Consulting talk about Azure Automation and how you can run your PowerShell scripts from the cloud. You may not be using Azure and Cloud Services just yet, but you can still get a head start! Attend Desmond Lee’s (MVP from Switzerland) session to learn tips and tricks for automating management tasks with Skype for Business. Once again, even if Skype is not your thing, you will see that what he demonstrates can be applied to other technologies and of course, you can catch him and ask any questions you have at any time during the event. You will get a lot from listening to Benjamin Hodge (KEMP Technologies) as he demonstrates how you can start writing good quality code. Even as a beginner, you can clean up your code and adopt some good practices to add that professional edge. Sit in on Ryan Yates (SharePoint Specialist from the UK) as he talks through some SharePoint management techniques. Again, if SharePoint is not your thing, that’s okay. You’ll see that a number of the things Ryan covers can be applied to other technologies, because they are fundamental to PowerShell, not specific to SharePoint. Learn from Deepak Dhami (PowerShell MVP, India) how to write tests for your code to make sure your scripts work properly in Production. Unit testing is for everybody! Even beginners! Give your scripts a professional level of quality and take your nervousness out of scripting by validating that things work as expected using a testing framework. Join Benjamin Hodge (KEMP Technologies) to learn about how to use API Services from PowerShell to automate application interactions. Need to manage a web application from PowerShell? This is where you learn to do it. Didn’t know you could interact with API’s from PowerShell? Now you do! Listen to me! Matt Hitchcock (PowerShell MVP and Consultant at Microsoft). My session is focuses on Visual Studio and how you, as a PowerShell scripter (beginner or advanced), can start using it to align to the work styles of your developer colleagues. You might not think this is so important right now, but I will surprise you. Come see how you can make your PowerShell use more collaborative and structured. Get a head start on your admin colleagues! And after all of that, come join us for food and drinks! Let’s talk PowerShell and any technology you want. Connect on LinkedIn with MVPs from around the world, who you can reach out to for help when you need it. Connect with like-minded people in the community, too. This is what community is all about; socialising, sharing knowledge and ideas. Throughout the event we also have giveaways and great food. And, you will be able to grab any of the speakers for Q&A or help with any problems you’re having (PowerShell or other technologies only — none of us are qualified marriage therapists, dog whisperers or anything of the like). Challenge yourself. Challenge yourself to learn something more advanced than the level you feel you are at now. You will probably surprise yourself. Challenge yourself to connect with the community, make a new friend, get a new idea, and drink a free beer! You won’t be disappointed.